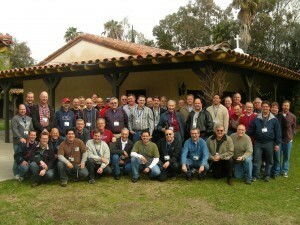 The Southwest Focus Retreat for Grace Brethren pastors continued today (Tuesday, January 26) in Rancho Capistrano near San Juan Capistrano, Calif. After the morning session, which focused on “Loving Christ’s Body,” the men gathered for their annual group photo (below). The afternoon and the dinner hour was set aside for fellowship and celebration, allowing time for the pastors to get to know one another better and to learn more about their respective ministries. When they returned to the retreat center after dinner, they gathered to celebrate successful ministries and to pray with those who felt alone or are hurting. The retreat concludes tomorrow (Wednesday) morning.